Opens the Standard Video Compression Settings dialog box. 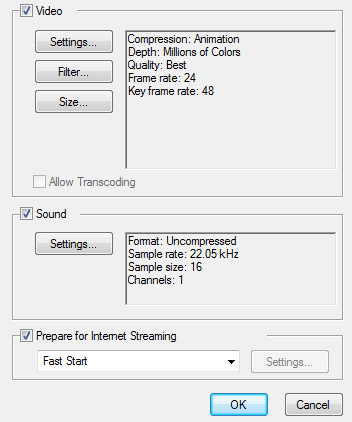 This is where you can set the video compression settings for the movie you will export—see Standard Video Compression Settings Dialog Box. Opens the Export Size Settings dialog box. The size settings are overridden by the Harmony's scene settings. Opens the Standard Video Compression Settings dialog box. This is where you can you set the sound compression settings for the movie you will export—see Sound Settings Dialog Box.